The Bullet Boot comes in multiple sizes to fit all standard plumbing vents and is an ideal flashing for all types of shingles. 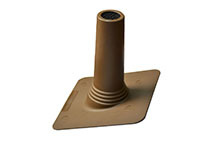 The Bullet Boot installs directly over standard PVC pipe providing water proof vent flashing. Most importantly, the Bullet Boot eliminates environmentally dangerous lead pipe boots.